On 26 September 2013, the International Livestock Research Institute (ILRI) and the Swedish University of Agricultural Sciences (SLU) signed a memorandum of understanding. 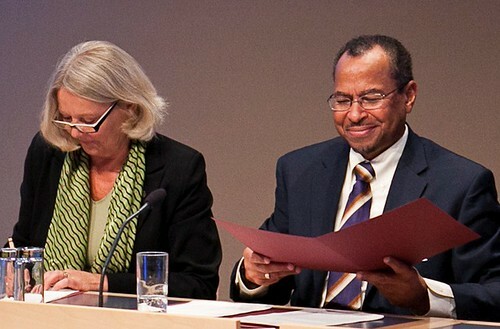 The MoU was signed by SLU vice chancellor Lisa Sennerby Forsse and ILRI director general Jimmy Smith. The MoU signing took place in the margins of the ‘Agri4D annual conference on agricultural research for development’, where Jimmy Smith gave a keynote address. The main objective is to establish a long-term relationship to exploit complementary research, institutional development and capacity development skills. It includes a specific objective to establish joint activities associated with the CGIAR Research Program on Livestock and Fish, including a role in the development and implementation of the program’s research-for-development agenda, which includes research and capacity building. Facilitating opportunities for MSc students to conduct minor field studies of 2–3 months at ILRI’s locations(s) or its partners. Providing post-doc opportunities at ILRI’s location(s) or its partners. Facilitating short-term exchanges and secondments of professional staff from one institute to the other. This entry was posted in Agriculture, CRP37, Event, ILRI, Livestock, Research, Sweden and tagged SLU by Peter Ballantyne. Bookmark the permalink. My name is Kalayu Mesfin from Ethiopia. Now I am working in Aksum University as a lecturer in biology and biotechnology department. I have MSc degree in zoology in 2012G.C and my MSc thesis was focus on fish density and water quality to improve food security. Published a research paper entitled ” Effects of Stocking Density of Nile Tilapia (Oreochromis niloticus) (L. 1758) and Types of Fertilizer on Water Quality in Earthen Ponds in Tigray, Northern Ethiopia ” by Kalayu Mesfin, Mekonen Teferi and Tsegazeabe Hadush International Journal of Engineering, Agriculture and Medicine (IJEAM), June 2013, Vol. 1, No. 1, 44-50. Now I need to start my PhD in the area of fishery and aquaculture what shall I do?